Because of You... the Girl Scout Volunteer!! Thank You! As we celebrate Girl Scout Volunteer Week here at Girl Scouts of Nassau County, I can never say it often enough, “Thank You,” to each and every one of our volunteers for all that you do. We know sometimes it’s not quite as fun as it is at other times, but everything you do makes a difference for the girls, even filling out those forms for the end of the year finance report and schlepping all those cookies. Thank you for everything that you do for our girls. 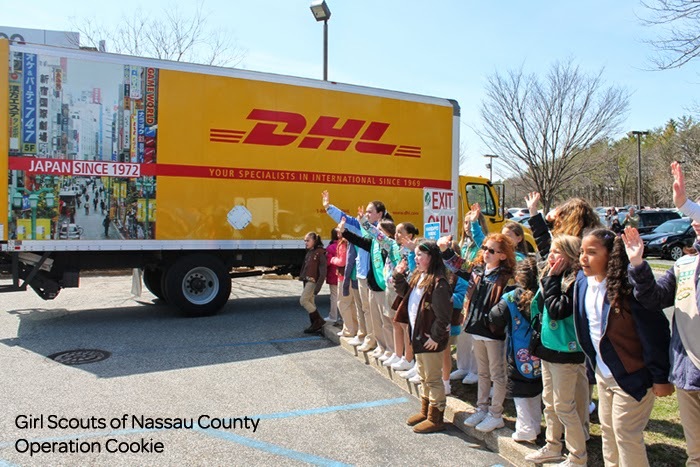 On April 17, 2014, Girl Scouts of Nassau County and representatives from DHL Express launched the 9th Annual Operation Cookie by preparing to ship a variety of over 1 million Girl Scout Cookies® to U.S. military serving around the world. Operation Cookie is a premiere Girl Scout community project which provides the opportunity for the local community to purchase Girl Scout Cookies to be donated to military personnel, local veterans’ facilities and other organizations. 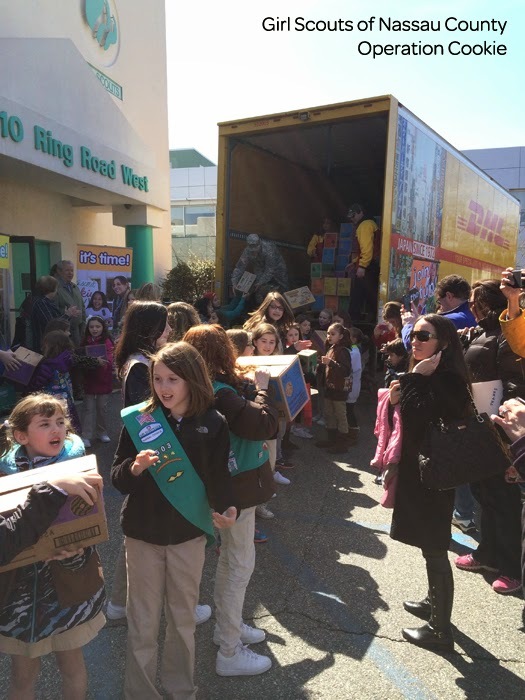 Representatives from DHL Express joined the Girl Scouts in preparing 60,000 boxes of Girl Scout Cookies for shipment. Because DHL Express is donating its shipping services, GSNC is able to distribute the boxes to U.S. military in oversea to places like Bahrain and Afghanistan. A BIG Thank You to all those who support Operation Cookie... the people who donate cookies to Operation Cookie, the Girl Scouts who sell cookies for Operation Cookie, the volunteers who support the girls and DHL Express for shipping the Girl Scout Cookies overseas to our Military who are serving. We appreciate everyone who takes part in this program and would like to say THANK YOU! Great Ways to Say Thank You! Each year, April 22 is dedicated to showing appreciation towards those Girl Scout Leaders and Girl Scout Volunteers who have helped build girls of courage, confidence, and character. Showing your appreciation and thankfulness for your Girl Scout Volunteers is important, because without them, you and your daughter’s Girl Scouting experience would not be possible. These volunteers provide a fun and unique experience, which will help turn our girls into the leaders of tomorrow. Bake them something...other than cookies because let’s face it we all have tons of cookies in our homes. Cakes and cupcakes are great because girls can do their own decorating and put a message on top for their Girl Scout Leader... baking also allows your Girl Scout to work towards some more badges. Hand-make a “Thank You” Card… Making a card will allow your Girl Scout to get creative. It will also allow her to express why she is thankful for her Girl Scout Leader. Write a Poem or a Song… If your Girl Scout loves to write or sing or play a musical instrument, she can use her interests and talents to her advantage. She can express her feelings in a way that interests her… this is another great way to work towards that Junior Musician badge. Make her a special mug! Does your Girl Scout Leader love coffee, tea, or hot cocoa? Make a special mug, just for your volunteer using ceramic mugs and oil based paint markers…. This doesn’t have to only be done on a mug; you can make plates too! Visit our Pinterest Page for Directions. Buy the Volunteer Appreciation patch from the Girl Scout Shop. Visit GirlScoutShop.org for a whole assortment of Girl Scout Volunteer Patches. Remember, these ideas are great, but a saying “Thank You” throughout the year will show how much you appreciate your Girl Scout Leader and Girl Scout Volunteer! For more Girl Scout Volunteer Appreciation “Thank You” ideas, visit Girl Scouts of Nassau County’s Thank You Volunteers!! Volunteer Appreciation Pinterest Board. CONGRATULATIONS to our two high school FIRST TECH Challenge (FTC) teams, the LEGOtronettes and The ICEBREAKERS who after winning many awards at local tournaments were both eligible to compete on April 3 – 5, 2014 at the East Super-Regional Championship Tournament in York, Pennsylvania. 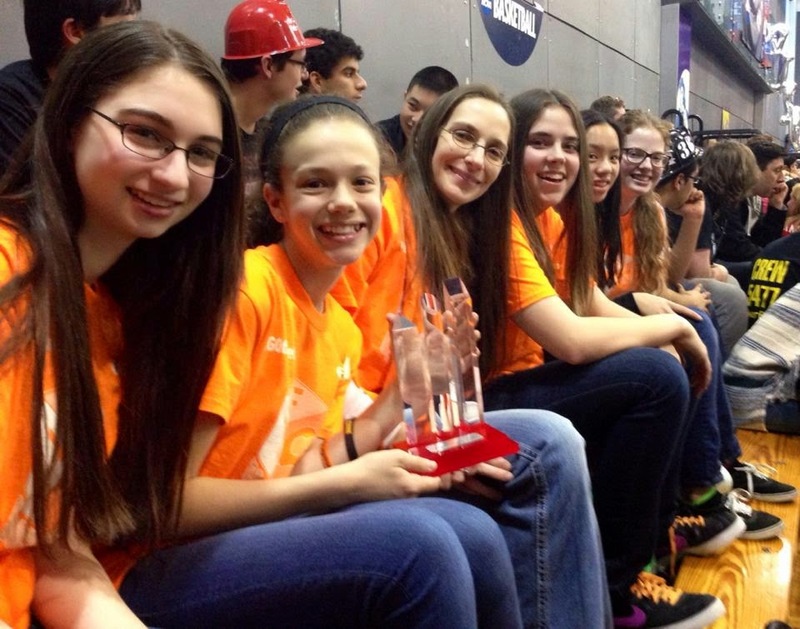 At the East Super-Regional Championship Tournament, The ICEBREAKERS won the Connect Award and are now eligible to compete at the FIRST WORLD Championship in St. Louis, Missouri on April 23 -26, 2014! We thank all of the girls, coaches and mentors for their hard work, dedication and for the wonderful way they represent Girl Scouts of Nassau County! When my Cadette Troop began working on their Silver Award, I had each girl create a binder for their project. This binder held all of their research material, time line, log of hours, and whatever materials, correspondence and photos they had for their project. This will come in handy if they are going on for their Gold Award. It’s a great resource to bring to the Gold Award Interview. Have a clear understanding of the difference between a Community Service Project and a Take Action Project. A Take Action Project looks at the root of the problem and tries to find long-term solutions that will have an impact even after your initial work. Try having your girls take this Take Action Quiz so that they get a better understanding of Take Action Projects. When the girls are deciding on their Silver Projects, make sure they pick something that is age appropriate for them, and something that is meaningful to them. If they have a personal connection to what they are working on, it won’t feel so much like work and it will be fun. Some Associations host ceremonies for their girls who are earning the higher awards, some don’t. Even if your Association doesn’t do a ceremony, you as the Leader should have a celebration for the girls to acknowledge a job well done. The GSNC Resource room has great information and sample ceremonies for you to follow.